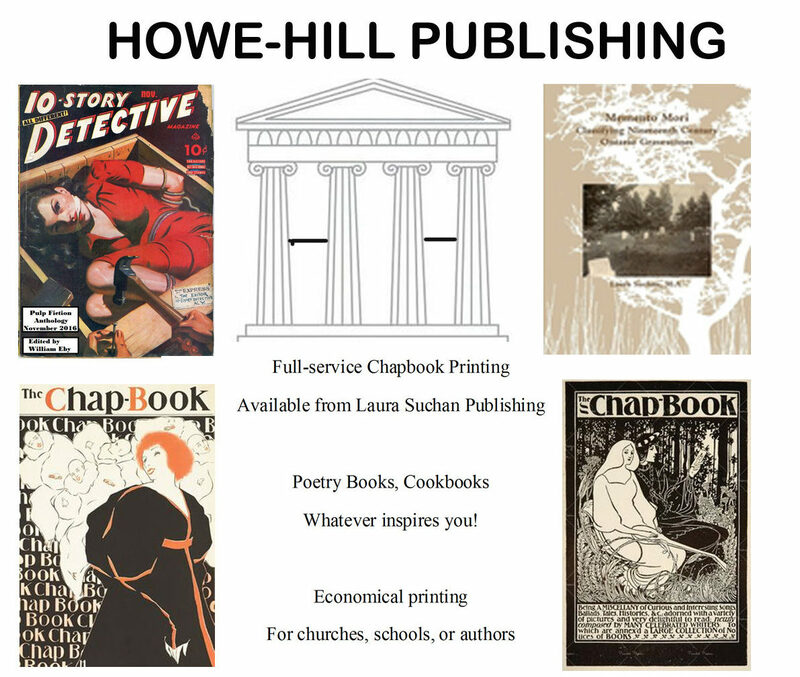 I am excited to announce my newest publication completed in collaboration with the Oshawa Historical Society/Oshawa Museum is now available! 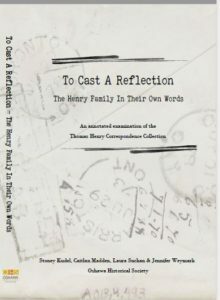 Entitled To Cast A Reflection: The Henry Family In Their Own Words it is an annotated examination of the Thomas Henry Correspondence Collection, which was donated to the Archival Collection of the Oshawa Museum in the spring of 2013. Initially the collection appeared inauspicious, with papers and envelopes packed haphazardly into a nondescript old box. Upon closer inspection, however, the Thomas Henry Correspondence Collection, as it became known, contained 520 individual documents including the personal letters, receipts and business correspondence of Reverend Thomas Henry, a well-regarded preacher, prolific writer, respected church leader and beloved family man. 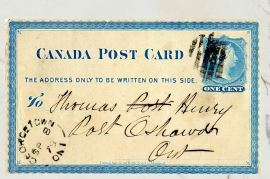 The correspondence spans the decades of the 1850s through the 1890s and contains letters written to Thomas Henry from his children, grandchildren and other family members, affording an up close and strikingly candid view into the life of one of Oshawa’s earliest settler families. As with most personal correspondence, these letters are written in a less formal, more narrative format than official records, expressing family relationships and highlighting events familiar to most: work and play, marriages and separations, illness and deaths. To Cast A Reflection: The Henry Family In Their Own Words examines and annotates these letters to show the many aspects of life in the 1800s and places the experience of the Henry family into a broader national and international perspective. At the core of this collection are the people, members of the Henry family, pursuing their lives in the latter half of the nineteenth century. Our intention with this publication is, as the title suggests, to cast a reflection on the Henry family in a way that will be familiar to us today and provide a more detailed picture of the social and political events of the time. This is in some ways not only the story of the Henry family but the story of everyone’s family. Written by Stoney Kudel (Oshawa Historical Society), Laura Suchan (Executive Director of the Oshawa Museum), Jennifer Weymark (Archivist of the Oshawa Museum), and Caitlan Madden (Research & Publication Intern). Buy it now on Lulu! About the Oshawa Historical Society and the Oshawa Museum: Nestled on the shores of Lake Ontario in the OM tells the story of Oshawa from Indigenous Inhabitants to present day. Home to Oshawa’s history, the Oshawa Museum is managed by the Oshawa Historical Society. The Annotated Memoir of Rev. Thomas Henry – Just released! Originally written, by his daughter-in-law Polly Ann Henry, The Memoir of Rev. Thomas Henry: Christian Minister, York Pioneer, And Soldier Of 1812 was published in 1880, the year after Henry’s death at age 81. 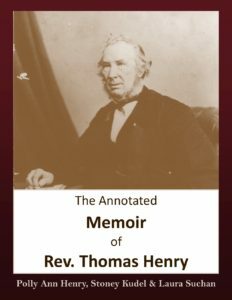 Born in Ireland, Henry became an ordained minister in 1832 and in 1840 was chosen as pastorate of the Church of Whitby which later became affiliated with the Christian Church. Never one to be idle, Thomas also became President of the Sydenham Harbour Company and became Harbour Master in 1850. Throughout his life, Henry traveled extensively attending Christian conferences and preaching. The stone house that Thomas lived in with his family still stands in Oshawa’s Lakeview Park and is managed by The Oshawa Historical Society as the Oshawa Museum. Throughout the 19th century, Ontario gravestones exhibited a remarkable progression of artistic, cultural and religious expression. Ever wonder what willow trees on a grave marker mean? How about flowers or hands? Discover the meanings of these and more motifs and develop an appreciation for the artistic expression to be seen in a pioneer cemetery. 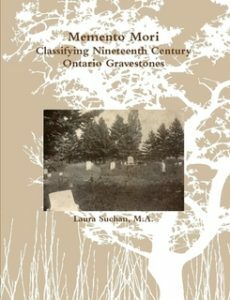 In Until Day Dawns: Stories from Oshawa’s Union Cemetery, authors Laura Suchan and Melissa Cole explore the history Oshawa’s Union Cemetery and some of the people buried there. 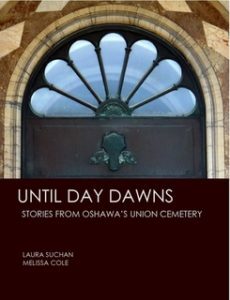 Laura Suchan, Executive Director and Melissa Cole Curator, of the Oshawa Museum, have launched a new book, Until Day Dawns: Stories from Oshawa’s Union Cemetery. Oshawa’s Union Cemetery has a long and colourful history spanning more than 175 years. Situated at the border of East Whitby and Whitby Township (today the City of Oshawa and the Town of Whitby respectively), the cemetery soon became known as a “union” burial ground serving the needs of both towns. It was described in 1875 as having “. . . large and handsomely laid out grounds . . . which will not only be a quiet and worthy resting place for the dead, but by the care bestowed upon it, be a credit to the living . “ As early as 1837, a church, manse, school and Presbyterian burial ground were located on this property. The first burial is believed to have taken place in 1837. Explore the stories, personalities and history that have shaped the City of Oshawa and surrounding areas.